This was a fun inaugural raced. I thoroughly enjoyed most of the course. 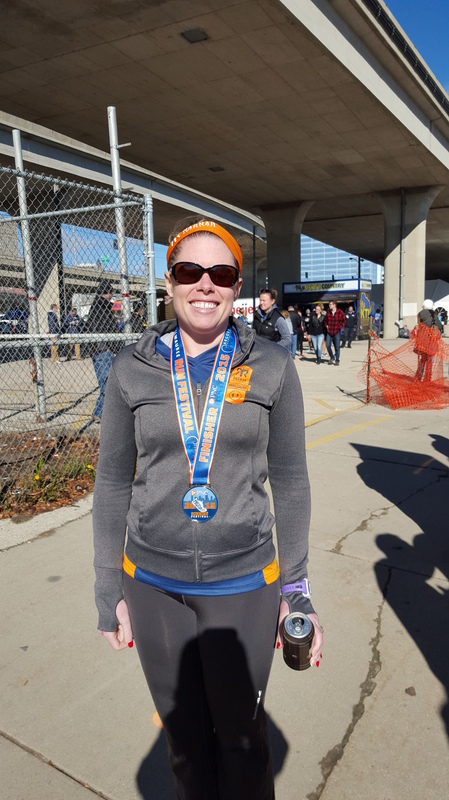 It wasn’t an easy course and I maybe should have actually looked closer at the course, but whatever, you have to run the 13.1 miles whether you know when you are turning or not. The Milwaukee Running Festival weekend started Saturday morning with the Mile Race and Expo. 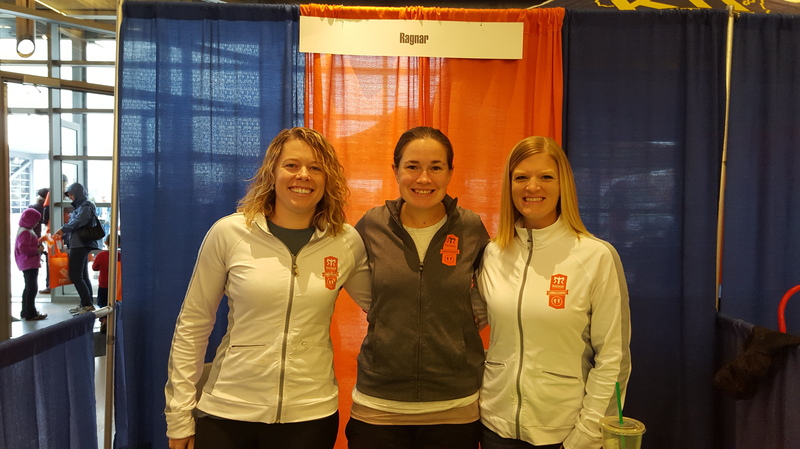 I was working the Ragnar Booth with Mo and Sara. It was a blast to see all the kids come in after running the mile race. I think it’s great how many of them were all smiles. There are now tons of kids running around Milwaukee in Ragnar shirts. It was a gross cold and rainy day so being stuck inside all day wasn’t terrible except for being stuck by the door that volunteers were holding open for everyone coming to the expo. After 8 hours of hanging out here a group of us went out for a pre-race meal. It was Halloween so I had to stop by home and leave candy out for the kids. I had two friends staying with me so we went home to prepare for race day. Let’s just say some of us are able to pick out our race outfits easier than others. We settled in for a pre-race movie and took it easy. I set my clocks back so we would be all set for morning. Side note: fall back on race morning is awesome. We woke up, got dressed and headed over to the start. Parking was easy enough. Not thrilled the ICC charged $5, but not bad either. We parked and found everyone else running. I love how many people I know at these races. 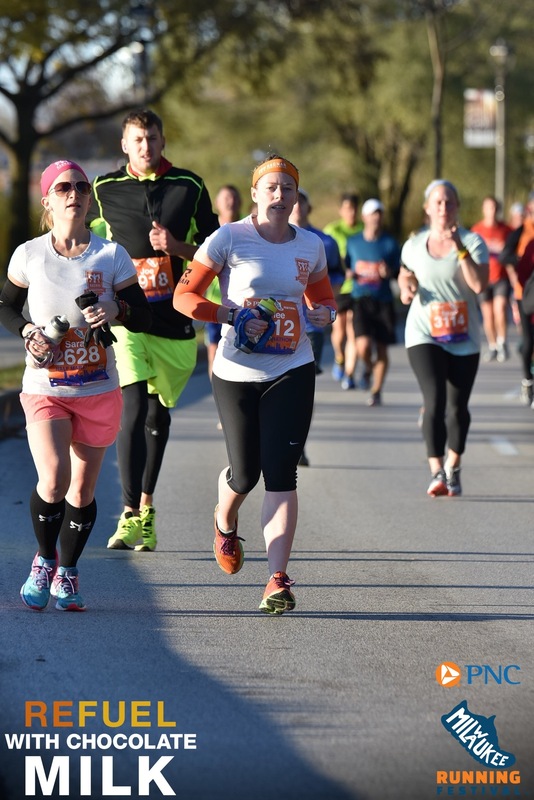 Milwaukee has a great running community and I love being part of it. There was a lot of excitement at the start. Sara and I found our place among the pace groups with the plan to not go out too fast. The weather was great and I felt good. We did pretty good not going out too fast. Miles 1-4: 8:50, 8:36 (oops), 8:43, 8:51. We knew about the hill at miles 3-4 and had run it several times this summer to just pushed on through. I saw a colleague at the top out cheering. Always fun to see a friendly face. I loved how the course wandered through the East Side. I never ever run over there. Miles 5-8: 8:24, 8:19, 8:28. 8:40. Going up Wisconsin Ave was a longer incline than I realized. We worked hard to get up that hill and enjoyed the crowd support near Marquette. We split from the marathon around mile 9 and headed south over 94. The bridge wasn’t so great. We chose to run on the sidewalk so as to not trip and harm ourselves. The awesome crowd support basically died as we separated from the marathon. The last several miles of the course were fairly desolate and there was a really weird turn that I feel could have been eliminated with distance added somewhere else. Miles 9-13: 9:00, 8:38, 8:38, 8:23. 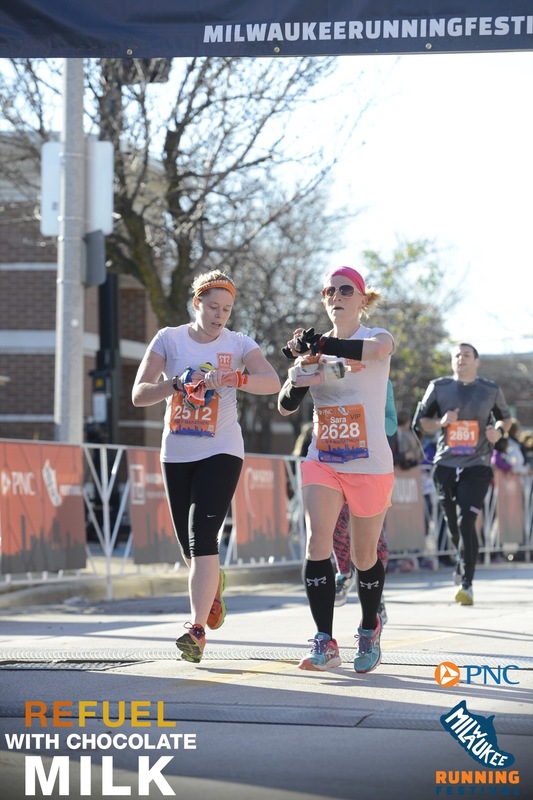 I did some really bad running math somewhere around mile 12 and was certain we wouldn’t get my PR. Running math is hard. I ran the .1 at a 6:46 pace and finished 20 seconds shy of my PR and my fastest time in almost four years. I almost cried and then desperately dug through old posts to find my PR. I am over the moon with how this race went. As I stated before, it was not an easy course and we ran it hard. A huge thank you to Sara for running it with me. We found more friends and several of us stayed at the finish to cheer for the half marathon and marathon finishers. It was super fun to see Tracey come in all smiles! And then Mo not much further behind, smashing her PR and breaking 4:00 hours! All in all I would say it was a great inaugural event. There are things to improve upon, but that is true of all races. I liked the half course. My biggest problem next year will be deciding between this and Tyranena as they are a day apart instead of six days. It was so fun to run fast again. I’ve missed it. I have no good advice other than to just get out there. It takes time.